Do any of you know any good Hair and Makeup people in Northants? 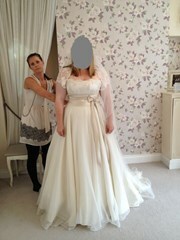 Want to look like a princess but not good enough to do my own!! I am based in Leighton Buzzard and cover parts of Northampton. I've been a makeup artist for 12 years and have worked on over 800 brides. Feel free to look at my website where you can see reviews and photos of my work etc. Thanks ladies will check both out! Thanks Cora, their work looks fab!! Have you had a trial yet? How far in advance do people book them? I've just emailed her to check availablility.